A few weeks ago, the Physicians Committee for Responsible Medicine launched a campaign to convince the University of Massachusetts Medical School to end the use of pigs in its Advanced Trauma Life Support (ATLS) program. Time was of the essence, as the program was scheduled to start on December 7. It surely would have been a “day of infamy” for the pigs destined to be killed as part of this trauma course. But the PCRM prevailed. More than 10,000 animal lovers contacted the dean’s office, and the dean has committed to permanently ending the use of animals in the ATLS programs, and did so before the December course started. The University of Massachusetts Medical School is now part of the vast majority of institutions that use only non-animal methods for ATLS courses. According to PCRM, just 10 out of the 227 surveyed ATLS courses in the United States continue to use animals. Most facilities rely on alternate training methods, including using high-tech mannequins, such as Synman and TraumaMan. Both have been recommended by the American College of Surgeons. Alas, another institution in Massachusetts refuses to switch to non-animal training methods. 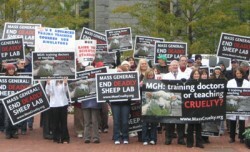 Massachusetts General Hospital (MGH) continues the use of sheep in ATLS courses. The PCRM is calling on people to contact Dr. Peter Slavin, president of MGH, and urge him to stop using animals in the ATLS program. It’s worked with the University of Massachusetts Medical School, and it could work at Massachusetts General Hospital.